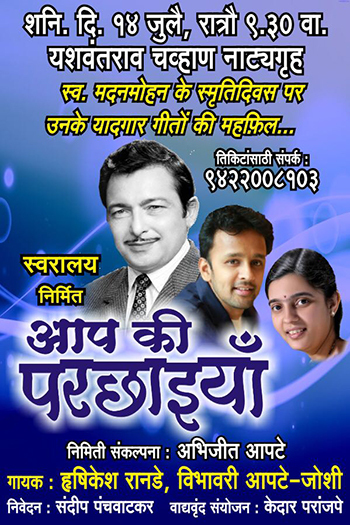 SWARALAYA, a Pune based music group, is once again presenting AAP KI PARCHAIYAN, a tribute concert on MADAN MOHANji’s death anniversary on 14 July 2018. They have been hosting this event for the last several years in memory of Madanji and his music. Being held at the Yeshwantrao Chavan Natyagraha, the concert will feature Madanji’s unforgettable songs performed by the very talented Vibhavari Joshi and Hrishikesh Ranade.